The set comes in an original wooden box, with compartments carved out for various instruments and accessories. Some of the accessories are now evidently missing. It is also not certain that all the items now present were part of the original set; the line-clinometer and plumb-level does not appear to fit in the box. The compass is of wood, with its upper face inlaid with ivory. There is an outer circular scale  to 24 running anticlockwise, divided to 1, 1/4 and 1/12, and numbered by 1 in red. Using the same divisions is a scale running clockwise  to 96, numbered by 1 in black, and with its numerals distributed over three concentric rings. The inset compass is 44 mm in diameter and its bowl is marked with a magnetic meridian flanked by two facial profiles outlined in green. The remainder of the upper face is decorated with inlay featuring strapwork, foliage and a bird. At the centre is a square hole in which accessories can be placed. The accessories include a brass index arm 217 mm in length. It is held in place to rotate around the centre of the compass by a brass plug and wing nut. The index is shaped and engraved at one end, and has a fiducial line against which the scales are read. The section extending beyond the circumference of the compass is stepped down so that it is in the same plane as the base of the compass. This section of the index carries a scale of equal parts  to 50, divided to 10, 5 and 1, and numbered by 10. There is also a brass line-clinometer and plumb-level which rotate together about a column with a square-section plug which fits the compass's central hole. When inserted, the column projects below the compass base and there is a screw thread which was perhaps used to fix the instrument to a stand. The brass bob of the plumb-level is suspended in a cage. The line-clinometer consists of a circular arc over which a hinged index arm can rotate in the vertical plane. The arc has a semicircular scale from vertex to nadir on both sides 12 to 12 [sic, 0 is implied] to 12, divided to 1 and 1/2, and numbered by 1. The index terminates in a hook to which a line could be attached and has heart-shaped apertures and pointers to indicate the reading. 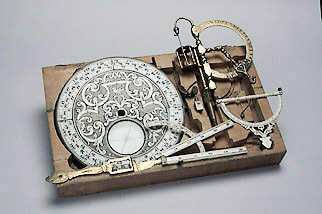 The set also includes a hanging ivory clinometer with a semi- circular scale of degrees  to 0 to , divided to 10, 5 and 1, and numbered by 10. The turned ivory diameter bar has suspension hooks at each end and a small brass bob suspended from the centre. The last surviving accessory is an ivory folding square with a quadrant arc. The two legs carry a scale of equal parts  to , divided to 10, 5, 1 and 1/2, and numbered by 10. The unit is the same as appears on the brass index arm. These are in principle sectoral scales, though it is not clear that the instrument was used as a sector. The quadrant arc runs from  to  degrees, divided to 10, 5 and 1, and numbered by 10. Formerly in the Michel Collection and then the Billmeir Collection (accession no. 57-84/135).